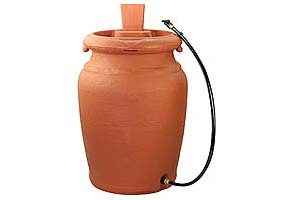 Marketing Copy This attractive urn style rain barrel with planter allows you to grow a plant, while collecting warm, chlorine free rain water, which your other plants will love. The rain barrel is made from durable, u.v. resistant plastic with a European textured finish and contains recycled content. It also includes an easy screw on 3 foot hose with shut off valve, hanging clip and elbow, which makes watering and set up easy. Conserving water is not only good for the environment; it can also save you on your water bill. Web site: © 2019 YIMBYhomeAndGarden.com • YIMBY name and logo is a trademark of "YIMBY"